We are on the look-out for creative, imaginative and fun-filled professionals to inspire the next generation of Master Builders! Successful applicants will express an enthusiasm for working with children and be passionate about bringing imagination to life. Launched in January 2015 Brickies Club is a fast growing weekly LEGO club for 5 – 11 year olds that aims to inspire the next generation of Master Builders. Everyone who joins Brickies will receive a competitive salary package as well as excellent opportunities for career development and the chance to work in a fun environment. Brickies is committed to safeguarding and promoting the welfare of children and expects all staff and volunteers to share this commitment. An enhanced DBS check will be sought from successful applicants. We are offering an exciting opportunity to not only be part of the Brickies team but be at the forefront of the fun as a Weekend Party Host / Club Leader. If you are passionate about working with children and inspiring a future generation of master builders, then this could be the perfect job for you. We are looking for an energetic, confident, caring person that can build rapport with children quickly and easily. The successful candidate will understand the importance of creating a balance of fun and engagement to ensure that all children have the best building experience possible. All our parties and clubs require the host / leader to deliver a presentation style story to set the building theme and challenges. It is therefore a requirement to be a confident public speaker that can deliver a presentation with passion and energy to groups of up to 40 children. Safeguarding is a top priority at Brickies and the host / leader will be responsible for the wellbeing of the children during the session. We are looking for an individual that has proven experience of working with children that can demonstrate awareness of potential risks. This position is based at our Wokingham Play Centre however the successful applicant may be required to travel outside of the Play Centre to deliver parties/ clubs. All travel expenses will be covered and equipment provided. The ideal candidate will have their own vehicle. Although we deliver LEGO building events, clubs and parties it is not a necessary requirement to be a competent LEGO builder. However, it would be desirable to have an interest in LEGO. This is a real job. You get to play with LEGO, make children happy and get paid for it. Don’t delay – apply today! Simply use the form below or drop an email to info@brickies.club and include an overview of why you would like to join the Brickies team! 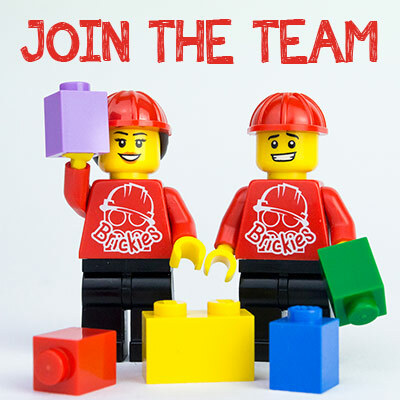 We are offering an exciting opportunity to not only be part of the Brickies team but be at the forefront of the fun as an After School Club Leader. If you are passionate about working with children and inspiring a future generation of master builders, then this could be the perfect job for you. All our clubs require the host / leader to deliver a presentation style story to set the building theme and challenges. It is therefore a requirement to be a confident public speaker that can deliver a presentation with passion and energy to groups of up to 40 children. Safeguarding is a top priority at Brickies and the host / leader will be responsible for the wellbeing of the children during the session. We are looking for an individual that has proven experience of working with children that can demonstrate awareness of potential risks. A full enhanced DBS check will be required, paid for by Brickies. This position requires travelling to different schools within a 10 mile radius of our Wokingham Play Centre where you will be based when not delivering clubs. A clean full UK driving licence is essential along with your own transport. All travel expenses will be covered and equipment provided. To apply for any of the above positions please send an email to info@brickies.club or complete the form below and include some information about yourself, career experience and why you think you would be suitable for the job.